This makes it quick and easy to access AUK Library on the go! Search AUK Library’s catalog, download items, manage your account, and find suggested reading instantly with your iOS device. • Search the AUK Library catalog: Search for items by title, author, subject, or general keyword and place holds on interesting items. 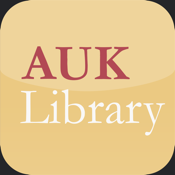 • Download items: Download ebooks from AUK Library’s catalog for reading on your mobile device. • Search by barcode: Use your device’s camera to scan the barcode on a book, CD, DVD, or other item at a friend’s house or bookstore and search for available copies at AUK Library. If you have any questions or concerns, please contact us at library@auk.edu.kw. Let us know what device and iOS version you’re using and the specific steps leading up to your issue, and we’ll work with you to resolve it.